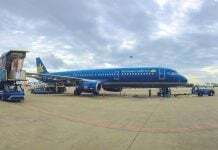 It’s difficult to dedicate a lot of time to one place in Vietnam and often itineraries try to include too much in a short vacation. If you are lucky enough to be spending two days in this poetic city, you’re in luck because its open arms will welcome you right away. With the advantages of cool weather and magnificent sceneries, Da Lat is a must-visit city when you travel to Vietnam. This pretty city is administered by Lam Dong province, located in the Central Highlands of Vietnam. The charming lakes, stunning waterfalls, and the romantic flower fields of Da Lat attract many couples to this city. 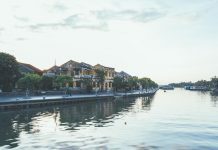 Two days is not a long duration, but you can optimize your time discovering Da Lat with the itinerary I recommend here. With your first morning in Da Lat, I am sure you are beyond excited. You should visit the most beautiful places in this romantic city. Da Lat is full of such awesome landscapes and buildings that it will be difficult to stop at the end of the day. But first, why don’t you have breakfast to store energy for you adventurous day? Take a look at this article to find yourself breakfast in Da Lat. Now, how about these recommended sites? 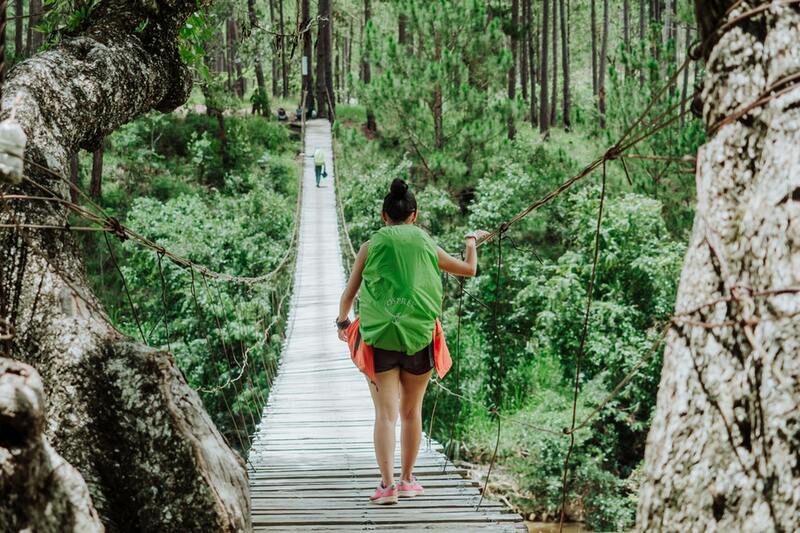 About 12 kilometers away from Da Lat city center, Langbiang mountain is the second highest mountain in Bidoup–Nui Ba National Park with the height of more than 2,000 meters. Standing on the peak of Liangbiang mountain gives you a wide view over the poetic city of Da Lat. You can see dreamy Da Lat flickering under the fog, the pretty lakes and streams from above twist around its village walls. It is said that you will feel as though you are in the kingdom of fairies and traveling on clouds. 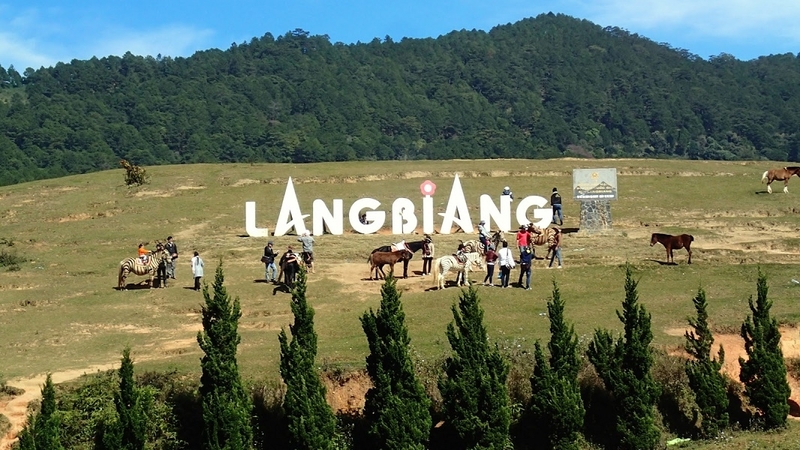 Moreover, on the summit of Langbiang, there are services offering food and drink, binoculars to observe the city, photographers to take professional memories, and even horses to ride. You can also see the statue of K’lang and H’biang, whose love became a legend and is the origin of the name Langbiang mountain. Cu lan is the Vietnamese name of a tropical tree fern, an endangered species of plant. A legend also exists saying that there once lived a boy looking for rocks to build a heaven for his lover. This action was considered stupid, and people called him cu lan. Now, cu lan literally means idiot in Vietnamese. In this village lives the K’Ho people, one of 54 ethnic groups in Vietnam. In Cu Lan village, you will have a chance to immerse in the large pine forest and listen to the babbling bubble of nearby brooks. 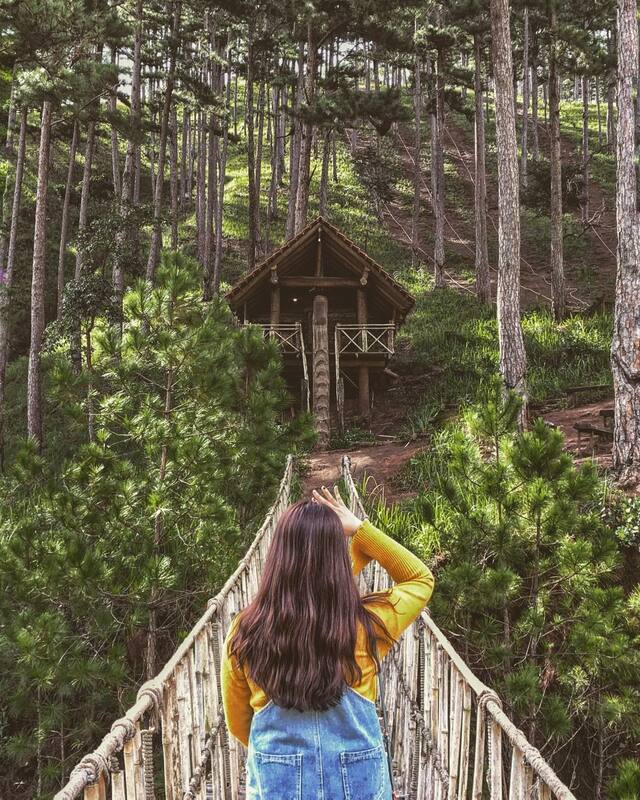 The houses located along the lake, the wooden bridges, and the green hills may bring you peace and tranquility. Cu Lan village is about 20 kilometers away from Da Lat center and it will cost you 60,000 Vietnamese Dong for an entrance ticket. Love Valley (or Thung Lung Tinh Yeu in Vietnamese) is one of the most poetic landscapes of Da Lat. During the time Vietnam was ruled by the French colonies, French couples recognized the romantic feeling of this valley and named it Vallée d’Amour, which also means the valley of love. You can admire the beautiful Da Thien lake, Vong Canh hill, tortuous paths, and the green meadow when visiting Love Valley. Pick and choose which ones most appeal to you because you probably won’t have time to see them all. The Love Valley also has romantic places for couples such as the love maze, love-locke bridge, flower stream, and peacock garden. The full ticket to visit Love Valley is 100,000 VND per adult and 50,000 VND per child. Finished in 2016, Lam Vien square quickly became one of the most popular sites to visit in Da Lat. This square attracts tourists with its special architecture. 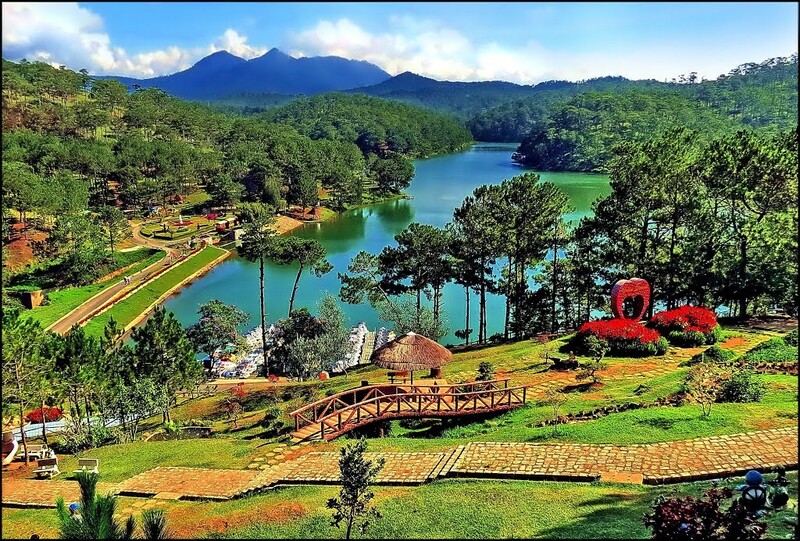 It’s located in Da Lat city center, facing Xuan Huong lake with a total area of 72,000 square meters. The coolest thing about Lam Vien Square is the gigantic wild sunflower built with colored glass. Da Lat railway station is the oldest station in Vietnam. It was built by the French colonies in 1932 and finished in 1938. The architecture of this railway station is styled after Langbiang mountain and the traditional stilt houses of the highland people. 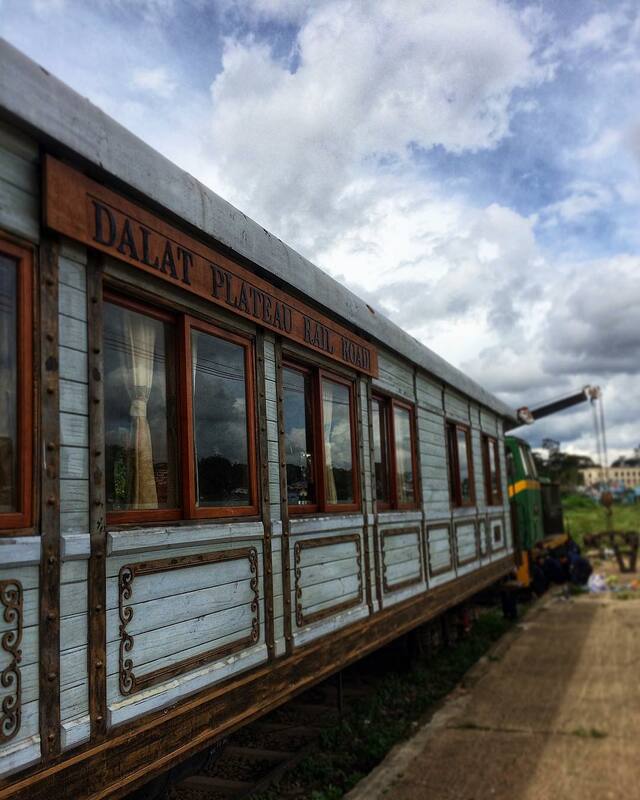 In the past, Da Lat railway station was used for transporting goods, but now it is used for tourism purposes only. This station offers just one route with the length of seven kilometers, lasting 20 minutes to reach Linh Phuoc Pagoda. What do you think about enjoying the dreamy beauty of Da Lat through the train window? 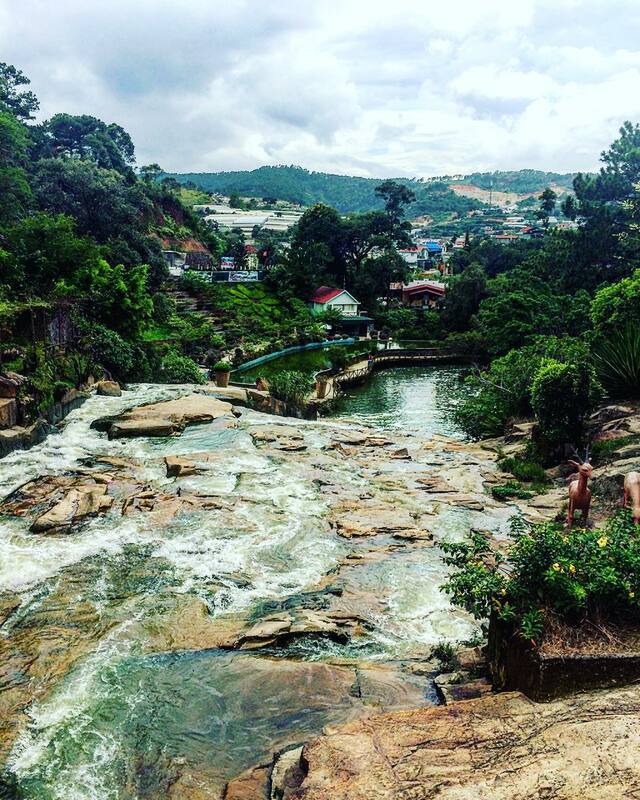 With a high elevation and tall rock formations, Da Lat possesses many charming waterfalls and lakes. In my point of view, these places will have the most luring appearance under the light of the afternoon, when the water becomes more twinkling than any moment of the day. Let’s choose which ones you should visit! 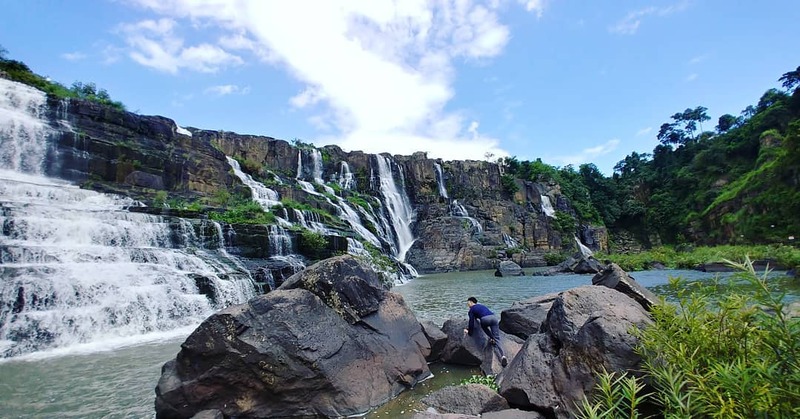 Pongour Waterfall: is located in Duc Trong district, 50 kilometers away from Da Lat. Pongour waterfall has seven levels with the height of 40 meters and the width of more than 100 meters. 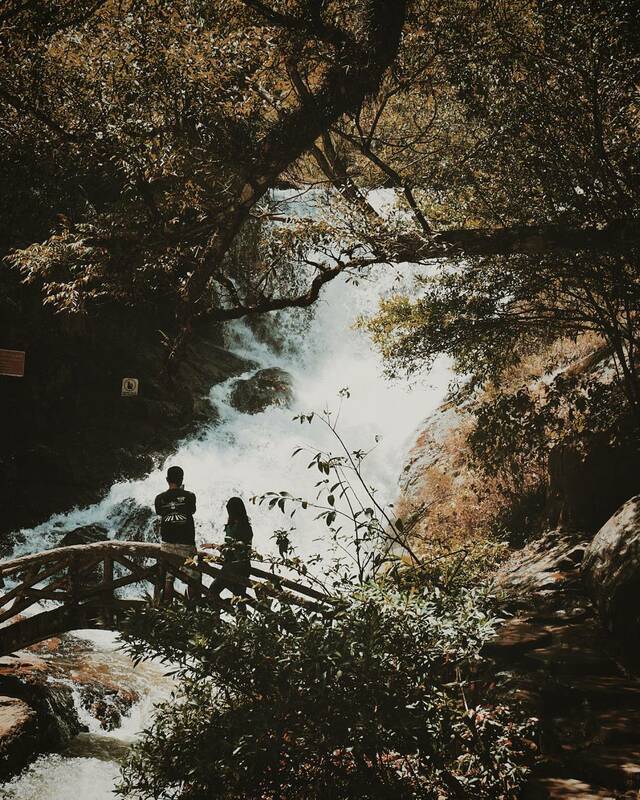 Prenn Waterfall: is located in ward 3, Da Lat city. During the rainy season, the waterfalls create the shape of a gigantic water entrance gate. Datanla Waterfall: is eight kilometers away from Prenn waterfall and ten kilometers away from Da Lat city center. This waterfall also has seven levels of rock. Water cascades down and shimmers off the rocks, creating a magnificent view. 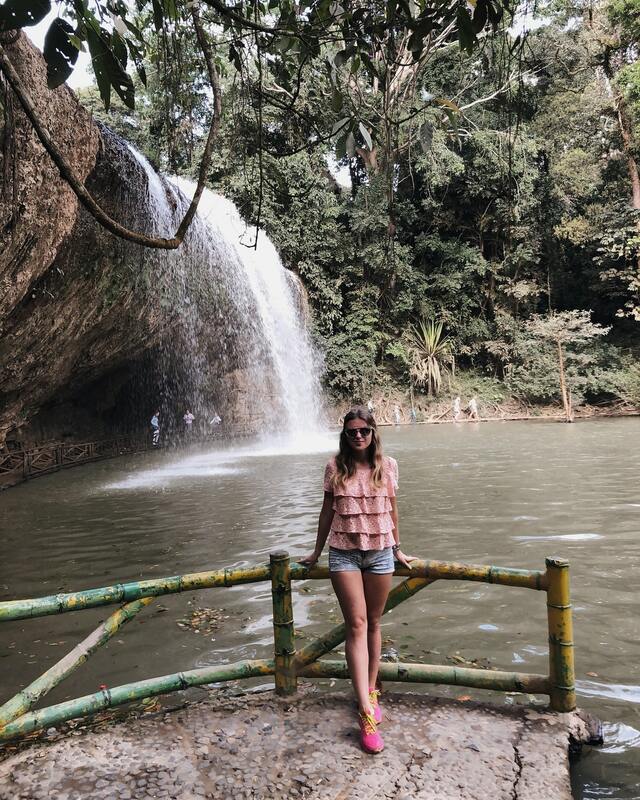 Cam Ly Waterfall: is a small but pretty waterfall in the city center. Cam Ly waterfall flows to Cam Le stream. At the foot of this waterfall, there is an appealing flower garden. 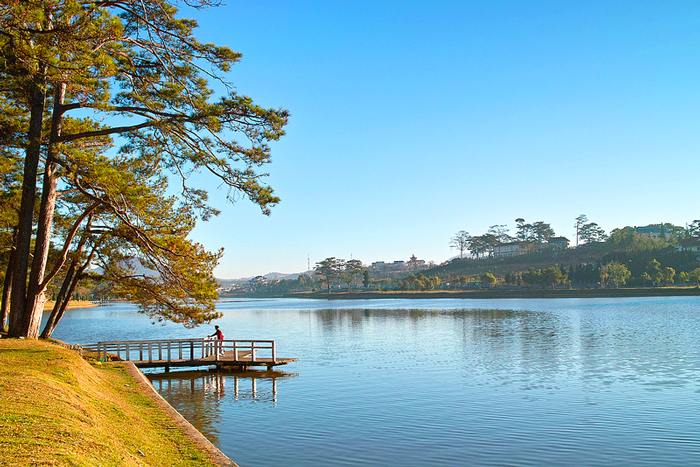 Xuan Huong Lake: is a symbol of Da Lat city, located in the city center. This lake has a crescent shape. Da Nhim Lake: is located in Dran town, 40 kilometers away from the city center. From this beautiful lake, you can visit Ngoan Muc pass, one of the biggest passes in Vietnam. Tuyen Lam Lake: is the largest lake of the area, seven kilometers away from the city center. Tuyen Lam lake is surrounded by many stunning flower gardens. Than Tho Lake: is to the north of Da Lat city. Pine forests surround this lake. Many travelers come to Than Tho lake to find a peaceful atmosphere. Da Lat is not only beautiful because of its appearance, but also because of its spectacular food culture with many cool dishes. I suggest you spend your night conquering the kingdom of food in Da Lat. We have collected the Top Ten Da Lat Dishes You Should Not Miss so you can decide which ones to enjoy. You may be interested in banh can Da Lat, which originated in Binh Thuan province of southcentral Vietnam but is considered tastier than the original one. 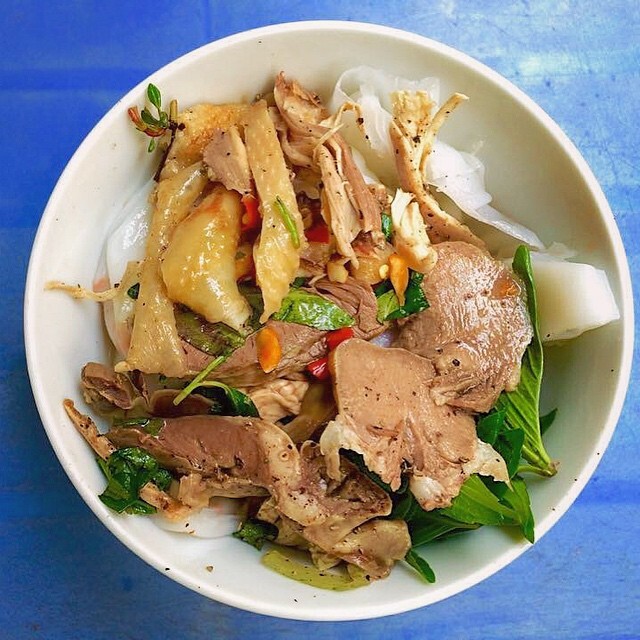 You can try banh uot long ga, which means steamed rice paper with chicken tripe. This is an unfamiliar combination because in Vietnam, people don’t eat streamed rice paper with chicken tripe, but with Vietnamese pork sausage. 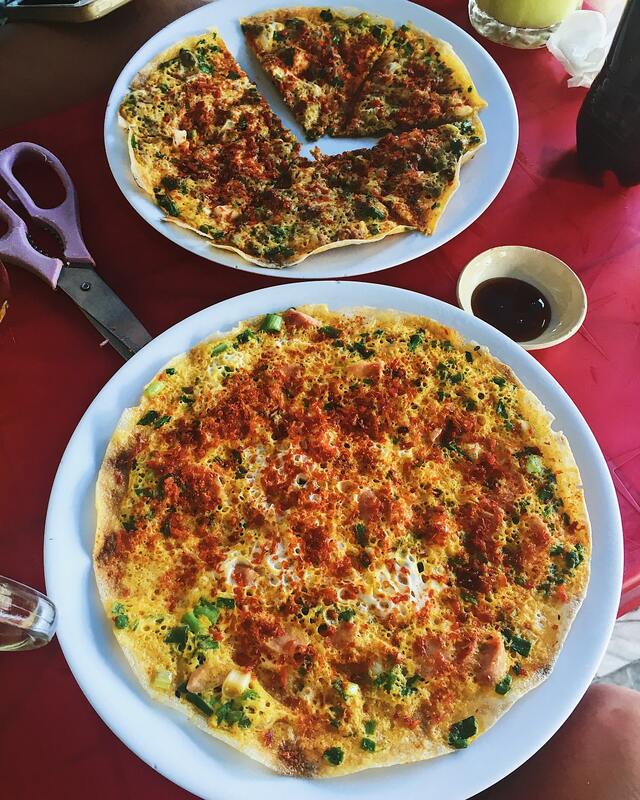 The banh trang nuong, also known as Vietnamese pizza, is the most popular dish in Da Lat. It’s not actually a pizza, but check it out for yourself- it looks quite similar. The combination of minced pork, shrimp, green onion, egg and chili sauce on grilled rice paper will give you a special and unforgettable taste. Da Lat is home to many captivating cafés where you can spend your morning sipping your cup of coffee and relaxing in a cozy space. You can reference this article about Charming Cafés and Restaurants for Brunch in Da Lat. Even though it was written to guide travelers to find places for brunch, most of the cafés mentioned are open starting at 7 AM, ready for your relaxing morning. How about Religious Sites for Your Next Stop? Da Lat also has several beautiful pagodas and churches. Located in a highland area, Da Lat definitely has a tranquil atmosphere. Therefore, religious places in this city will offer you a serenity that you cannot find anywhere else. Truc Lam Zen Institution: was built in 1993 and finished on March 19th, 1994. It is located along Tuyen Lam lake. To reach the main building, you need to climb 140 rock steps. You can also visit Truc Lam Zen Institution and Tuyen Lam lake on the same day. Linh Phuoc Pagoda: is located at the end of the Da Lat railway station line. 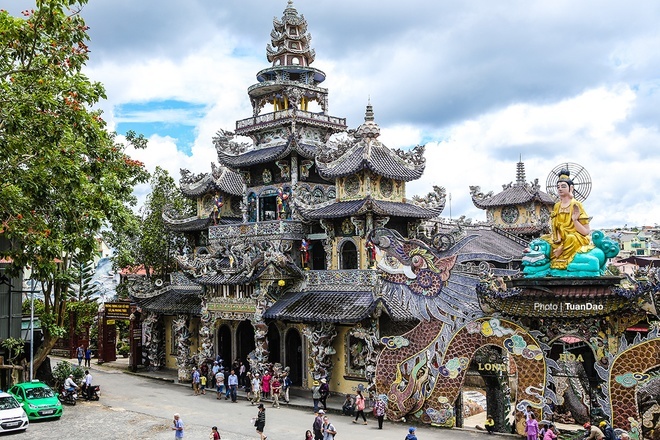 This pagoda is famous for its encrusted walls of painted pottery. Also, it is home to a dragon statue 49 meters long made of 12,000 beer bottles. 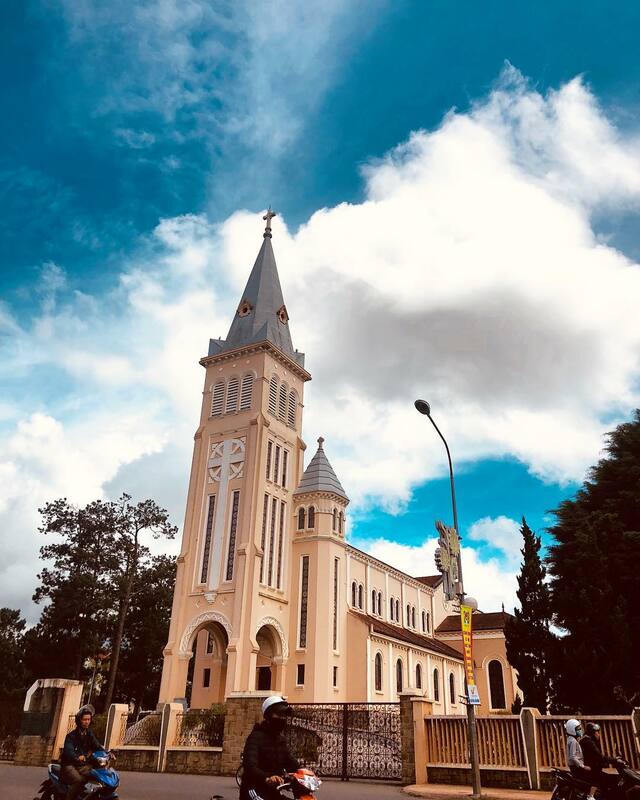 Con Ga Church: is the cathedral of Da Lat city. It’s called con ga, which literally means chicken, because it has a huge bell in the shape of a chicken. 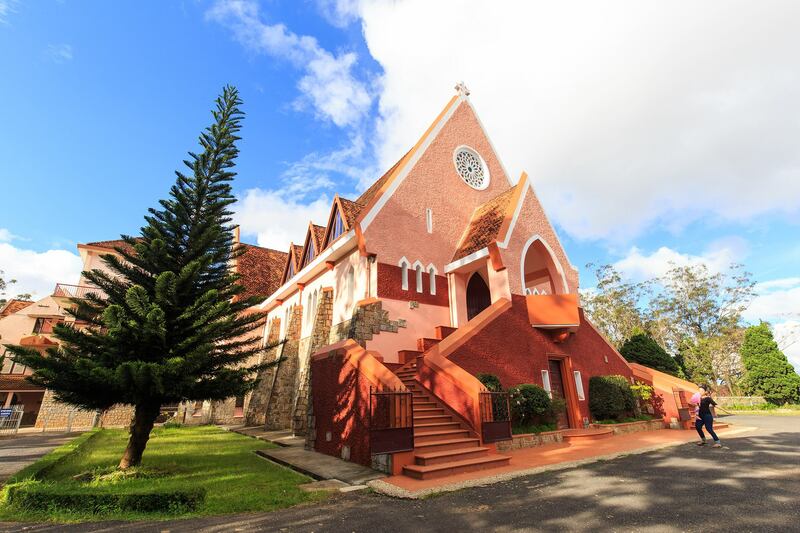 Domaine De Marie Church: is located in the dreamy Mai Anh hill, just one kilometer away from the city center. The church is painted in soft pink and orange and is designed based on the stilt houses of the highland people. People call Da Lat the City of Flowers. One of the most interesting activities you should not miss when visiting this city is enjoying the flower fields. Due to the cool weather and nutritious soil, Da Lat is host to many kinds of alluring plant life. In this article about Da Lat During Flower Season, we cover the famous flower fields to discover. You can spend all your afternoon admiring the subtlety and captivating colors of these flowers, smelling them in the wind, and listening to the sound of peace. You can wonder Da Lat all day visiting places and moving to the next discovery. But when it turns to night, your options change. Instead, Da Lat will offer you several interesting night activities. You can wander around Da Lat night market and buy yourself food, drinks, and souvenirs. 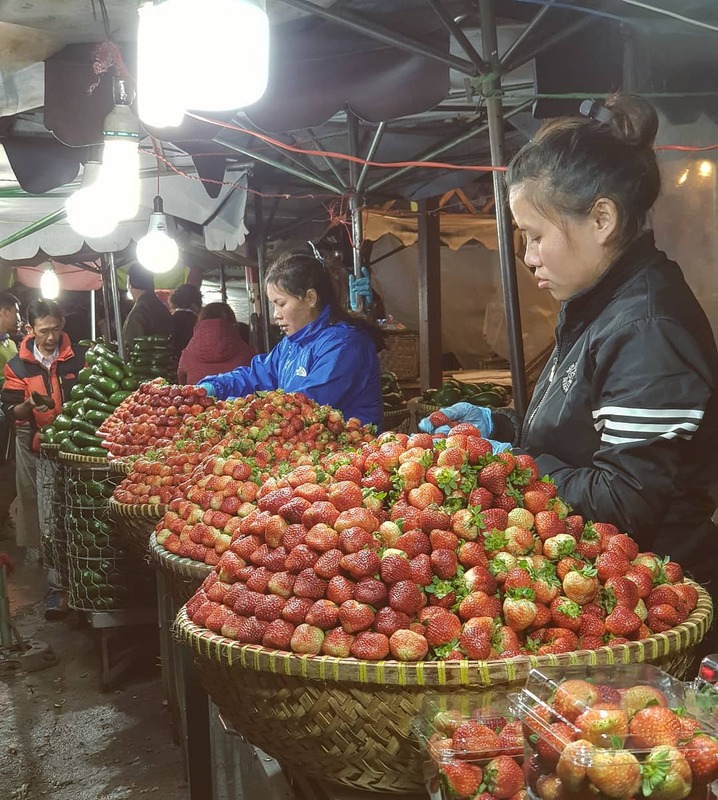 After 7 PM, Da Lat night market attracts many people to buy and sell. Pro tip: You should be careful with price. Ask for the price before eating or drinking. Sometimes the price before and after eating changes, so you should stay firm or go as far as filming the statement of the price. 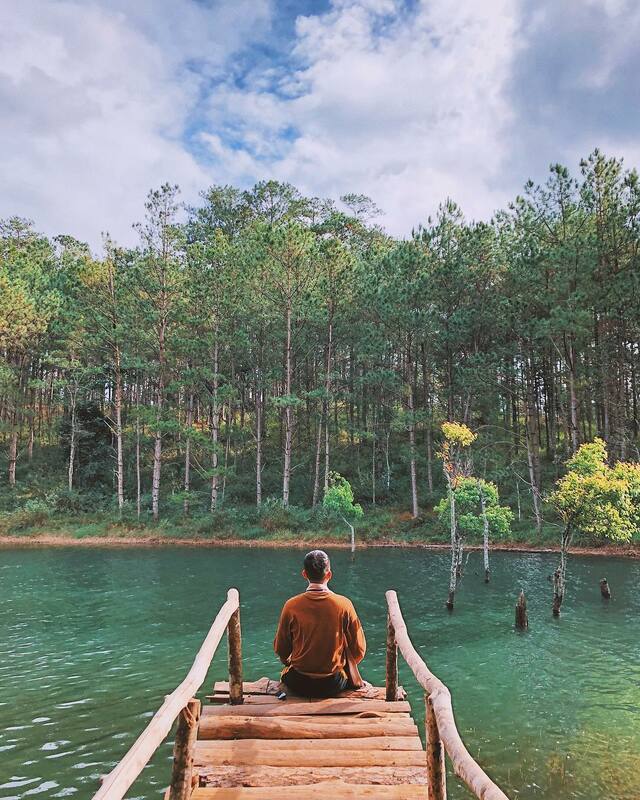 Walking around Xuan Huong lake is one of the best choices in which to spend your night in Da Lat. If you visited Xuan Huong lake and want to return, night is a perfect time. Many couples choose this walk to be together and enjoy the romance and peace of the dark water. The lake’s circumference is just about five kilometers, so you will need only 45 minutes to walk. Thanks to the flourishing tourism industry, the hospitality in Da Lat has developed so fast with numerous choices for a home away from home. If you decide to spend two days discovering Da Lat, you should book a comfortable place. What makes the accommodation business in Da Lat special is their cute and adorable designs. Most of the hotels and homestays are decorated to parallel the general environment of Da Lat, which is peaceful and poetic. These accommodations not only offer you a place to sleep but they also feel like home. Visit our article Where to Stay in Da Lat for further information and book a pretty room for you and your family. We also have our own accommodation in Da Lat and I can guarantee its quality and character. 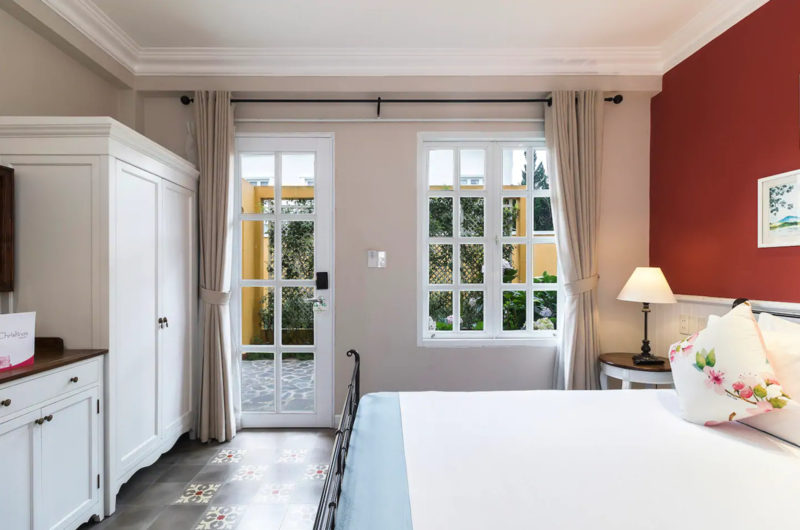 Christina’s Da Lat has rooms and villas that are elegantly decorated which are perfect for a delicate getaway in this romantic capital. These French-style Bich Dao Villas, apartments with balcony views to the city, and spacious kitchens will ensure your stay comes with everything you need for an enjoyable vacation. You can just spend a day reading books in your suite with natural sunlight coming from large windows, or relaxing under the sun in the hydrangea and lavender gardens with a warm cup of tea or coffee near. In addition, our Christina’s ecosystem also provide comfy private cars to transfer you from the airport to your accommodation and vice versa. To book the Christina’s accommodation, visit our website or Airbnb, and click here to book your airport transfer, so you don’t have to deal with that hassle when you get there. The above article is my suggestion for two days and one night in the romantic city of Da Lat. 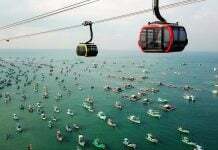 I hope it will be helpful once you start planning your trip to this charming city.